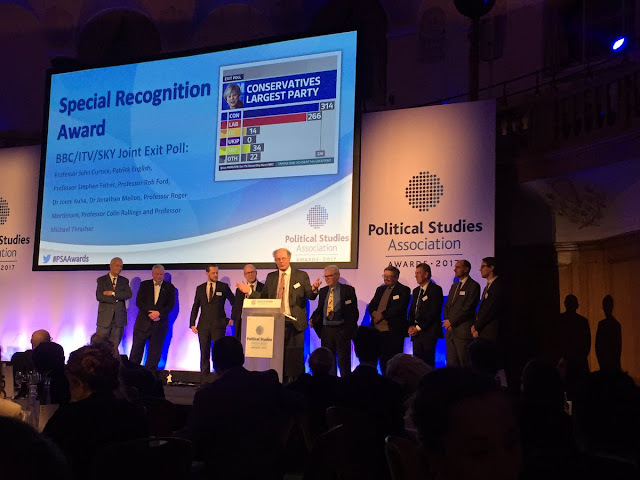 PME Politics: Political Studies 'Special Recognition' Award - Thank you. Political Studies 'Special Recognition' Award - Thank you. This month I was honoured and thrilled to receive a Special Recognition award from the Political Studies Association alongside my exit poll colleagues. Photo: Miranda Nunhofer... who also made a very good point about our (lack of) gender diversity! Myself, Dr. Jonathan Mellon, and Professors John Curtice, Rob Ford, Steven Fisher, Jouni Kuha, Michael Thrasher, and Collin Rallings were all recognised by the Political Studies Association for our efforts in constructing and developing the exit poll during the day of the June 23rd 2017 election, and informing coverage of the election throughout the night and into the next day (it was a long old shift!). Firstly, many many thanks to the Political Studies Association for the award! It was my second time doing the exit poll (having joined the team in 2015), and the second time that we had released a shock prediction (Conservatives largest party, maybe majority in 2015, Conservatives largest party, no majority 2017) which - this year to a particular extent - proved to be pretty on the money. A spurious correlation, I'm certain! But nonetheless, it has been brilliant to have each of our contributions to this amazing success recognised by the academic community. As John Curtice said in his acceptance speech, every single one of us brings something unique to the table and works absolutely flat out on the night and the week(s) proceeding it to bring the prediction and analysis together. My job in the team is primarily to construct the database of contextual and political variables associated with each of our 650 constituencies before the election itself. On the night, I work hard running analysis and spotting trends that might make for interesting discussion and reporting on the election program. Also, in a new development this year, I had the fantastic job of trying to keep on top of and summarise the Twitter rumour mill and seeing how reports at counts and private meetings were matching up with our predictions! It is an academic exercise at our end, but the entire operation would fall apart without the huge range of non-academic staff involved in and integral to every part the process - the exit poll really is one of those rare grounds where academia, the professional world (the BBC, ITV, Sky, Ipsos-Mori, Gfk), and the public (voters and viewers) truly, truly meet. For all of the us, the planning and preparation for the exit poll (and for our work on the night covering the trends and patterns of results as they come in) takes months of work, hundreds (probably thousands) of emails and phone conversations, and a whole host of trial, retrial, error, and last minute 'save-the-day' fixes. Fortunately, we are blessed with an amazing squad of academics and a brilliant results team at the BBC who bring the whole thing together for the day and on the night. The actual polling is handled jointly by Ipsos-Mori and GfK, and is of the highest quality, organisation, and reliability. When those reports come into us during the day, we don't even think about second guessing them. On the night of the results, we (the academics) are just one part of a big team of people in the BBC studio who are responsible for coordinating and managing the flow of results and predictions back and forth. Again, nothing is possible without those guys. Special shout outs go to Producer Tim Hammond, operational-organisers-in-Chief Rosie Sheed, Julia Walker (née Sherman), and Lizz Loxam, all the results inputters and BBC researchers, and Elect Systems Ltd gurus Richie Butler and Matt. There are so many more who help out the team and make the show what it is from every other conceivable angle - but the above people are the ones who I have contact with and make everything I do possible in particular. Thank you to everyone. The exit poll and on-the-night election coverage operation is massive, and while it's amazing to be recognised for it, there's no pretending for a second that I (or any of us) would have got anywhere near this award without everyone mentioned above. Thank you. Finally, I can't do a 'thank you' piece without acknowledging the role that my family, friends and non-exit poll colleagues have played, who have constantly and consistently been supporting and pushing me throughout my academic journey. My father immigrated to this country in the 1980s with £10 in his back pocket, and the promise of a job as a security guard at a South London firm. My mother is the daughter of a travel agent (and later a Police Constable - the job my father also went into after I was born) and a typist. They (the whole family) worked tremendously hard to raise me and to give me the best chance in life - and taught me a valuable lesson in dedicating yourself to be the best version of you that you can be, and never to give up. A huge thanks to the teachers at my schools - particularly William Farr Comprehensive School (as it was then) and 6th Form College, where the maths and history departments worked tirelessly with me keeping me on track, and spotting my interest and talent guided me into a life of studying politics and numbers. A huge thanks to all my University Supervisors and Tutors who have also worked very hard keeping me on the academic straight and narrow (always had the glimmer in my eye of making it as the next Lionel Messi... nowadays it's more Steph Curry) - Dr Alistair McMillan, Professor Maria Grasso, Dr Maria Sobolewska, and Professor Rob Ford. The latter two were the ones who got me onto the exit poll team in the first place. Lastly, my partner, Emma, my close friends, and colleagues too deserve special mentions for putting up with the lows and enjoying the highs with me. I would not have had my name up on that screen without them all. So I want to dedicate this award (or perhaps more accurately - my 1/10 of it) to everyone who has put their faith and time into me. But this is just the beginning - the road ahead to academic relevance and success is long and winding, and I fully intend to follow each and every one of its twists and turns. The next stop - PhD hand-in just over a month away!! !